In the still of the night, falling into slumber to the sounds of a light rain she lays on her stomach stretching her legs in search of a cool spot in the sheets. A ritual for settling in between the layers of comforters, naked and nesting she slowly unwinds from her day. 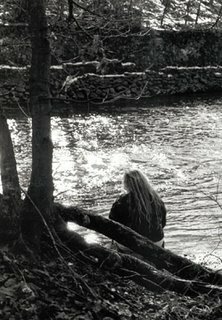 A vision of her sitting on the bank of the river early today fills her mind. The sounds of waters gliding past her, the smells of soaked earth soon replace gentle rains sounds and smells of fresh downy sheets. Her mindful thoughts fall away as she enters into a dream. Unaware that the clouds are rolling fast above her head she’s walking the rivers banks searching for a spot that will securely hold her secret. Raindrops are falling making the trail wet and slippery as she weaves in and out of the brush and trees. She is using her coat-protected arms to fight back the prickly stems that stand tall and plentiful, making her way difficult. Driven with confusion she can’t stop here. The weight of her boots that have been collecting mud stops her in a track allowing her to look up from the trail. Her eyes scan the area, all her senses become clear in the silence. She spots a tree, an old odd tree that stands tall with large branches and a hollow in its trunk. Using a branch from the ground she knocks the mud from her boots and walks straight to the tree. The hollow is high and appears to run deep within her truck. At the bottom of the tree, directly below the hollow on the ground she sees small bones and several balls of fur caught in the twigs and brush. Thinking out loud she notes in a whisper this spot must be perfect, once an owl's choice and they are wise aren’t they? From her coat she pulls out the brown hand towel that wraps around her secret several times making it a oblong bungle of terry cloth. Without any more thought she drops the bundle into the hollow and then standing on her tip toes she looks to see how far down it traveled before it came to rest. As she stares down into the hollow a chill travels straight through the weight of her coat, her hands are cold and her hair is dripping wet from the light drizzle. She looks above and the clouds are still rolling over only they have gathered together in shades of light to dark grays. Turning to the river she walks to the edge and sits for a moment to gather her thoughts. Her eyes scan every direction looking for markers for remembrance should she ever need to get back to this exact place. Feeling the elements of the weather that has moved in to surround her she knows she must make her way back. Uncertain how far she had walked she knew she could follow the tracks and she starts back. The rain is falling harder now and darkness is coming slowly so she pushes herself harder through the brush and then a thought comes clearly into mind. She was meant to find that tree and the rain was meant to fall and smoothing away to erase her footprints. Can it be possible? Could this be the perfect…? Sounds of thunder off in a distance rumble through the darkness of her room waking her from her dream. Closer and closer comes the rumbling and in between the rumbles could be heard what sounded much like the loud pounding on her front door. Fully awake her mind processes the noise that wakes her from her dream. She sits on the side of her bed pulling a heavy sweatshirt from the floor over her head. Standing to pull on her sweatpants she feels her heart jumping as she realizes now that the thunder has found it's way to her front door. Great job! You are such a talented lady. You do it all! Are you going to go forward with this? I`d love to see it!